This is a continuation of the Kings point – Louse Point beach. It is reachable via Barnes Hole Rd. The beach faces Napeague Bay to the east. Starting at Barnes Landing and walking south you will soon reach the remains of a pier belonging to the famous Bell Estate. The estate was a 500 acre beach front property in its hay day, but it is now subdivided. Dennistoun Bell built the dock in 1931 after giving the East Hampton Town Trustees land near Fresh Pond for a park in exchange for the beach in front of his property, reaching from Albert’s Landing to Barnes Hole Road. The dock, which is now in shallow water, was in water deep enough for Bell’s 70-foot-long yacht. The property was developed after Reginald Lewis bought it for approximately $4 million in 1988. Three years later Dr. Bell’s mansion, Broadview, burned to the ground. All that remains of its original grandeur is the dock and a covered stairway, from the bluff to the beach. Neighbors are still arguing about the future of old Bell pier, while experts disagree on whether it causes or hinders erosion. South of Old Bell Pier there are a number of easily passable erosion control piers and soon you reach Alberts Landing Rd. Albert’s Landing Rd marks the northern margin of Dennistoun Bell Park and Little Albert’s Rd runs along the northern border of Fresh Pond within the park. Both roads lead to the beach. There is a large parking area at Albert’s Landing Rd, a public bathroom and a picnic area in the woods with benches and fireplaces. there are similar facilities at the end of Little Albert’s Rd. If you walk along the beach heading south you will ultimately reach the outlet from Fresh Pond and unless you want to wade through water several feet deep you can not proceed. This beach is sandy, a good bathing beach, shallow and “family friendly”. There are good stone and shell finds and a good amount of sea glass too! Abraham’s Landing is at the end of Abraham’s Landing Rd. which splits to the north from Route 27, just after the Amagansett train station when you are heading east. You can leave your car at a large parking area, just by the Devon Yacht Club. Or you can turn left on to Cross Highway which runs parallel to the beach and you will end up at another parking area about 1/4 mile down the road: this is Fresh Pond Park which is known for a beautiful and peaceful small park area overlooking Fresh Pond from the south side of the inlet. This is a great place for family outings. The beach is nice too, for bathing, shelling and even stones, but it is a short beach: from Fresh Pond south to Abraham’s Landing and then a few hundred yards to the inlet for the Yacht Club which is private. This is a favorite beach for watching July 4th fireworks staged by the Devon Yacht Club. Abraham’s Landing is named after Abraham Shellinger (of dutch descent), an early settler in Amagansett (1690), who was captain of the sloop Endeavor, a merchant ship carrying whale oil and other merchandise to Boston. He became the first Supervisor of the Town of East Hampton in 1700. After the Devon Yacht Club there follows a long stretch of beach facing Napeague Bay to the north. It is very difficult to find access to this beach. The road is called Lazy Point Rd or Cranberry Hole Rd. Your best bet is to leave your car somewhere near Lazy Point at the eastern end of the road, where there are several small parking areas. There is a small community of homes by the beach, called Napeague. Carl Safina lives here. He is an author and an ocean scientist and ecologist of national fame. If you walk west along the beach, in the general direction you came from while driving to Lazy Point, you can walk for 4 miles (one way). It is a long walk but the athlete Kevin Joseph swam along this beach the entire way! This is NOT an easily accessible beach and there are a number of obstacles, but it is well worth you while. At first you will have to navigate some erosion barriers which is sometimes not possible at high tide, as the homes are built close to the water. 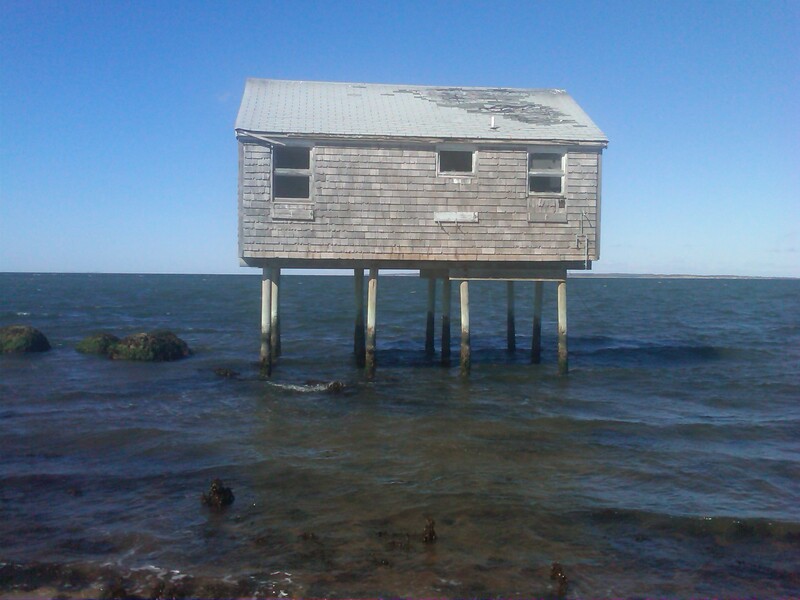 One abandoned house on stilts is really in the water! This is a favorite hang out for the local photographer John Todaro who has taken beautiful pictures of the house on stilts. About half way down the beach you will pass the Smith Meal Fish Factory: two large rusted hangers abandoned for the past 30 years. 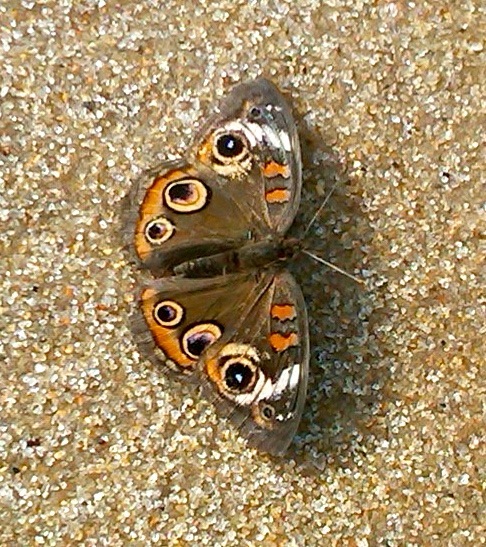 They are now part of the Napeague State Park. They are visible from afar. The factory used to process 20-30 million menhaden fish per year, which were used for fish meal. 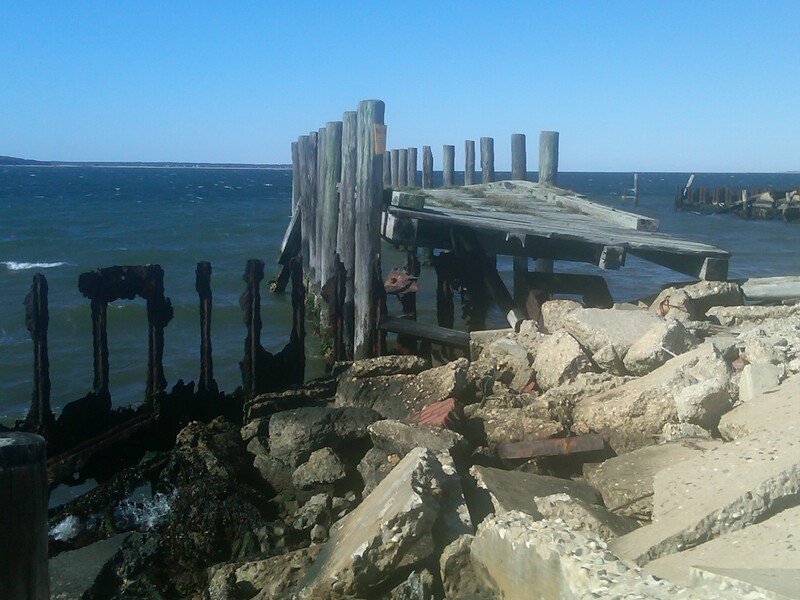 It was owned by Otis Smith and closed in 1969 due to a drop in supply of menhaden! Sounds like they over-fished the species. Right next to the hangars is an active fish farm – Multi Aqua Culture Systems. They do not allow access to the beach through their property. But in the summer you can get great lobster rolls here. The “beach area” is in fact a war zone of crumbling piers and docks well beyond repair and quite difficult and even dangerous to pass. I thought the large cracked and slanted cement slabs looked like there had just been a major earthquake! If you are going to attempt this walk we strongly suggest you do it at low tide. Beyond the fish farm (to the west) the beach is wide and sandy and you can proceed all the way back to the inlet of the Devon Yacht Club. It is a long walk. Along the way you will pass a very high chimney that stands on its own close to a funny looking house! The chimney was also part of the Smith Meal Fish Factory and produced fertilizer from the fish products. I guess this contributed to the smell that permeated the area and that people still remember. The area in general is called the ‘Promised Land’ and there are several funny explanations for this name related to the Smith Meal Fish Factory! For collectors: the beach itself (specially around the fish factory) has some industrial and construction waste on it – as always that is a good sign for beach glass. On our last visit we found a rare peach orange colored piece of glass and quite a few more common green and white pieces. This beach is desolate. Ours were the only foot prints. (a) West shore: If you leave your car at one of the small parking areas by Lazy point, you can walk to the point itself which is marked by some rocks and situated just opposite Hicks Island. There are narrow inlets to the west and to the east of Hicks Island and they represent the water inlets to Napeague Harbor . This is where there are strong currents as the tides move in or out and some fisherman like these spots for catching striped bass or blue fish. Hicks Island is just sand and dunes. I was told that at low tide you can wade through the water on to Hicks Island if you come from the east (not from Lazy point). Take in the views from Lazy point. This is truly a beautiful spot. Napeague Harbor is a round body of water approximately 1 mile across. It is shallow (24 ft at its deepest, but mostly 6-8 feet). Because of the winds it has become a Mecca for wind surfers and kite boarding. Any visitor to Lazy point is likely to see wind surfers and kite boarders in action – watching them jump and let the wind carry them quite a distance in the air can be entertaining. Because of marshes and state park lands on both sides, Napeague Harbor is also a favored spot for kayaks and canoes. The beach along the west side of the Harbor is characterized by patches of dark brown or rusty sand, but mostly by marshes. It is really not a much of a bathing beach. It is often a difficult walk specially at high tide. But if you do walk along the eastern shore of Napeague Harbor you will come across a small cluster of beach cottages built right up to the water. Some of them are brightly painted. They are also accessed by road via Crassen Blvd and Shore Dr. East or Shore Dr. West. 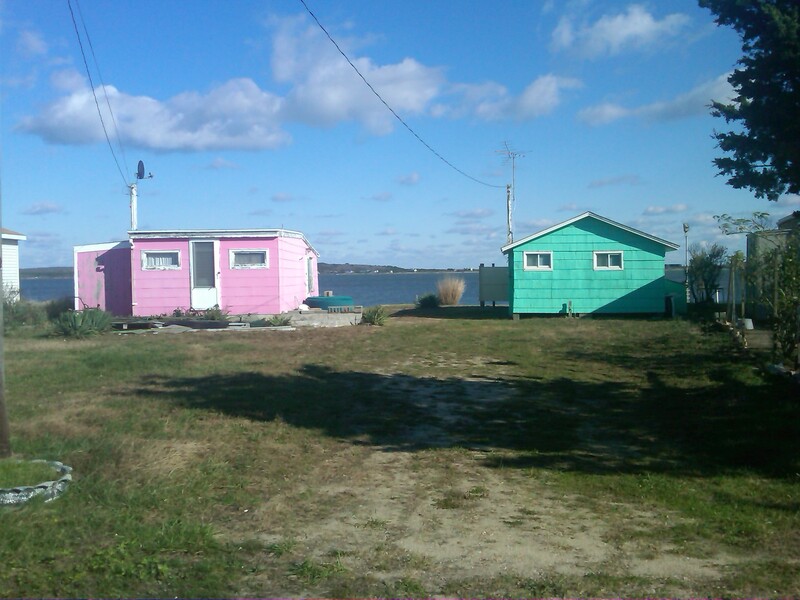 Once you pass these homes the beach is interrupted by a series of inlets and marshes and no longer passable. Because these are park areas the wildlife is plentiful and birdwatchers should enjoy the area. If you are a beachcomber, these beaches have great beach glass. This is where Napeague stretch is really just a 1/4 mile wide and it is good to recall what it looked like the day after the 1938 hurricane! You can access this beach by driving to the Art Barge. Look out for high radio tower as you are driving east on Montauk Highway. Turn left on to Napeague Meadow Rd, cross the train tracks and turn right. There is not a lot of space to leave your car by the barge, so you might have to leave it on Montauk Highway. The barge houses the Victor D’Amico Institute of Art. D’Amico was the director of education for Moma in NYC from 1937 – 1970. He worked with local fishermen to dock a barge at its present location! A 2nd story was added later and the barge is now open in the summer for art classes. The D’Amico house is right next to the barge. The adjacent radio tower is called the Mackay Tower. It has been in operation since 1927, through 2nd World War and is currently used by the New York State Police. Walking east from the Barge is difficult too. After 1/4 mile you will have to turn around or wade through water draining some marsh lands. Another point of access is via Napeague Harbor Rd which connects to Montauk Highway. There is an unmarked sandy dirt road that services several private homes (10-52) and leads to the beach and you can walk east until the marshes are impassable again. If you continue along Napeague Harbor Rd., it soon comes to an end at a large bill board with information on the Piping Plover. This is a good place to leave your car. From here you can access Hither Hills State Park by following the indicated path to the Walking Dunes or you can walk along the beach: to the left brings you back to private homes and the beach is impassable, but to the right you can walk for miles along the eastern shore of Napeague Harbor, see below. This spot has great views to the west at sunset looking across Napeague Harbor. You can walk along this beach all the way to Goff Point separated only by a narrow canal from Hicks Island. These are beautiful undeveloped beaches with a back dune marshy ecosystem that supports several rare plant and animal species. The Walking Dunes of Hither Hills State Park can be seen from the beach and there are marked trails that start at the beach if you want to visit these dunes. Hicks Island is one of only a relatively few roseate tern nesting areas in the Northeast and there are “Do Not Enter” signs all around the island. I have done this walk many times. Usually, we leave the car at the end of Napeague Harbor Rd by the Piping Plover sign. The beach is narrow and the sand is redish and sometimes dark brown or even black. I am told that some of the sand is magnetized and can be picked up with a magnet (courtesy of John Todaro)! 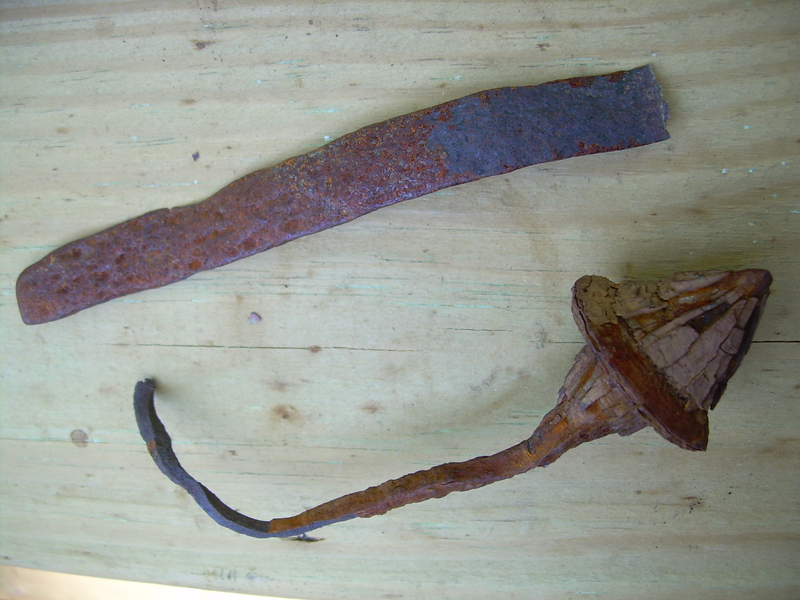 This means it is magnetite (Fe3O4), also called ferrous ferric oxide. Magnetite crystals can be found in bacteria and in the brains of some animals. It is speculated that this may provide some animals with a sense of the earth’s magnetic field and the ability to navigate long distances to find their breeding grounds. This is not a beach for bathing and there are few rocks, shells or sea glass. 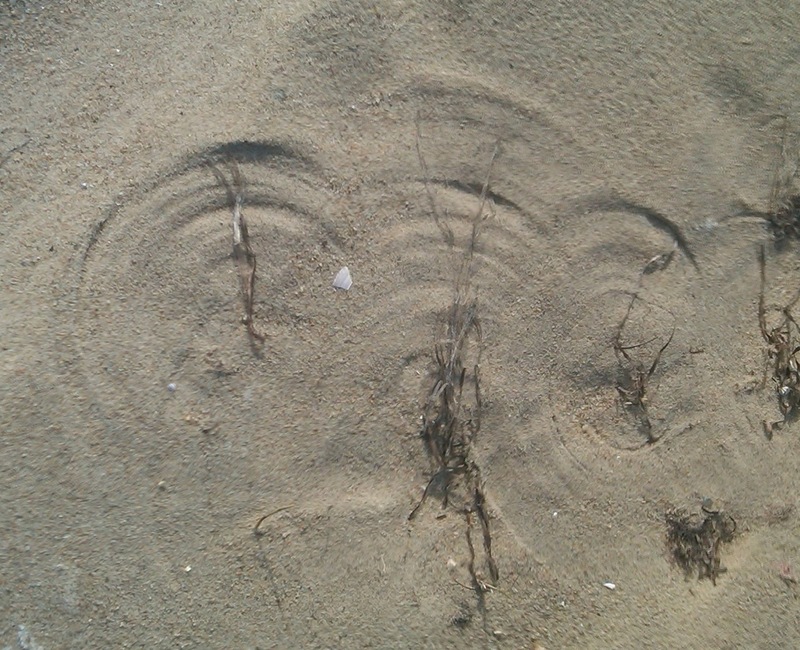 We recently walked this beach on a windy day with swirls of wind coming from different directions. As a result the “beach grass” (Ammophila Brevilugata or American Beachgrass) which is anchored in the sand was blown around in circles creating interesting round patterns in the sand – I call them “wind shield wipers”. The photographer John Todaro has taken great pictures of the sands of Napeague Harbor. Until very recently we walked this beach unimpeded. 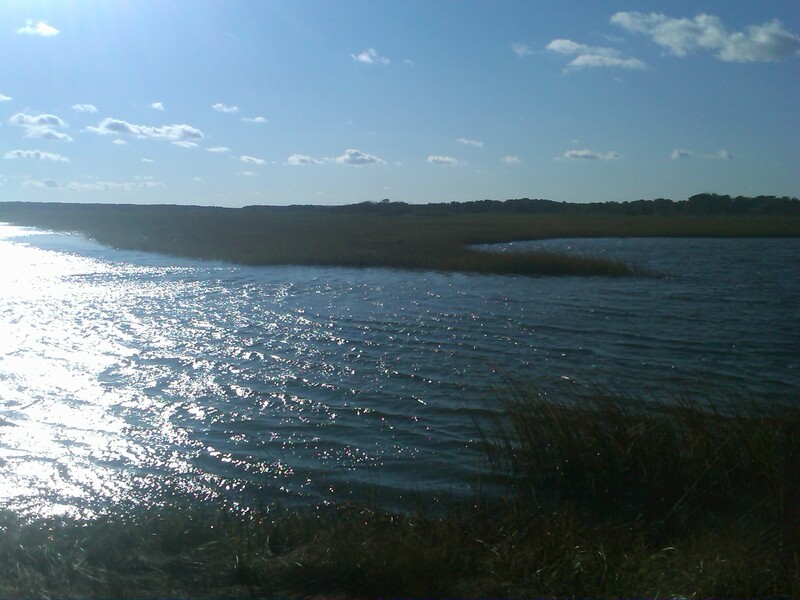 But on our last walk in November 2011, there were two large inlet canals draining the waters from the marshes behind the beach bluff. The water in these inlets was 4-6 feet deep at high tide. We got very wet wading through the back marshes! Also, there was a small canal between Goff point and Hicks island. It is no longer there – even at high tide! It seems Hicks Island is an island no more. To read more about the historical changes of Napeague Harbor and Hicka island take a look at this nice article by Larry Penny in the East Hampton Star. From Goff point you can see the north shore of Hicks island. There is a large ruin structure visible from afar. This was also part of the Fish Factory of the Promised Land described earlier. The highlight of this long and arduous walk is clearly the exceptional views in this secluded natural area. There are about 7 miles of beaches facing Napeague Bay and Block Island Sound to the north. Since you can not get there by car, you have to hike in, via trails through Hither Hills State Park. We suggest you get a map like the map designed by the Whalen brothers. It is unlikely that you will walk the entire distance and back, so we have divided these beaches in to 3 sections (from west to east). These are very secluded beaches and access is difficult. It is best to drive down Old Tar Rd. which branches off to the north from Montauk Highway just before the fork in the Road to Old Montauk Highway, when you are coming from Napeague. Old Tar Rd. is a perfect name! It is rugged with huge potholes, and not much surviving tar. You will need a 4×4 vehicle with lots of clearance. This road runs along the railroad tracks and eventually you will be able to cross the tracks on Fresh Pond Landing Rd. which leads down to the beach. There is a very nice look out area to the right on top of a bluff. There is also a parking area just by the beach. Turning to your left on the beach you can walk about 2 miles to the west where you end up at Goff point and Hicks ”Island” (see 17). This is a wide beach with plenty of sand. If you are looking for a spot with few visitors, this is it! I have been there several times and came across just one lonely fisherman (and his truck) complaining that the fishing was not what it used to be! This beach is excellent for drift wood, not too bad for finding sea glass and interesting stones, but there are few shells here except for the ubiquitous slipper shells. The beach faces north and is quite exposed to winds from the north west to the north east. It can get cold. Hither Hills and Hither Woods offer great hikes, interesting history, vegetation and wildlife. I recommend that you read Trail Guide to the South Fork by Mike Bottini, where several chapters are dedicated to Hither Hills. For instance I read that Fresh Pond Landing (and some other beach landings on the bayside of Hither Hills) were used to load ships with cordwood by day, and unload liquor by night during prohibition. If you are ambitious, you can leave your car at the overlook on Route 27 and hike down to Fresh Pond Landing (about 1.5 miles). There are several trails that will take you there. Best to leave your car at Fresh Pond Landing (see above). Going east it is a 3 mile walk to Rocky Point. The beach gradually gets narrower and more rocky and the bluffs rise to 50 feet on your right. This beach is exposed to the north and northwest and the winds and currents have washed large amounts of drift wood and junk on to the beach. 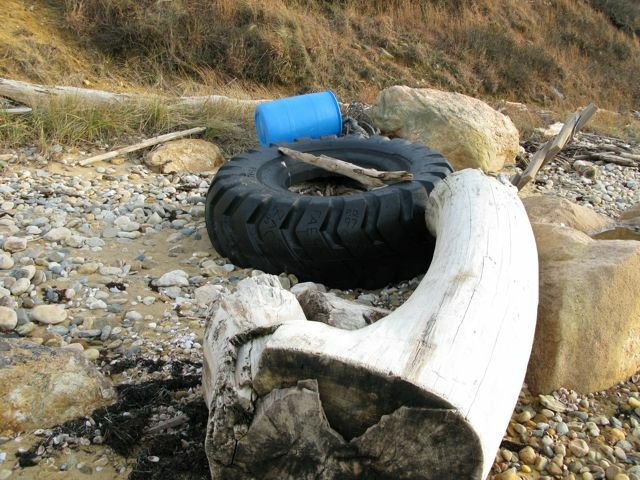 I mean plastic, fishing nets, ropes, buoys, even a 6 foot large tractor tire that must have washed ashore 14 years ago, as visitors have carved their initials in to the tire with dates and there is one carving dated 1997! The large amounts of drift wood represent a gold mine for some, like Carolyn Munaco Gaines, an artist from Hampton Bays who paints on drift wood. She tells me that she has taken her kayaks to the beach to load them up with drift wood, since the place is so inaccessible to vehicles. I was thinking of constructing a dog sled and using our German Shepherd (with boundless energy), but we will have to wait for snow fall! 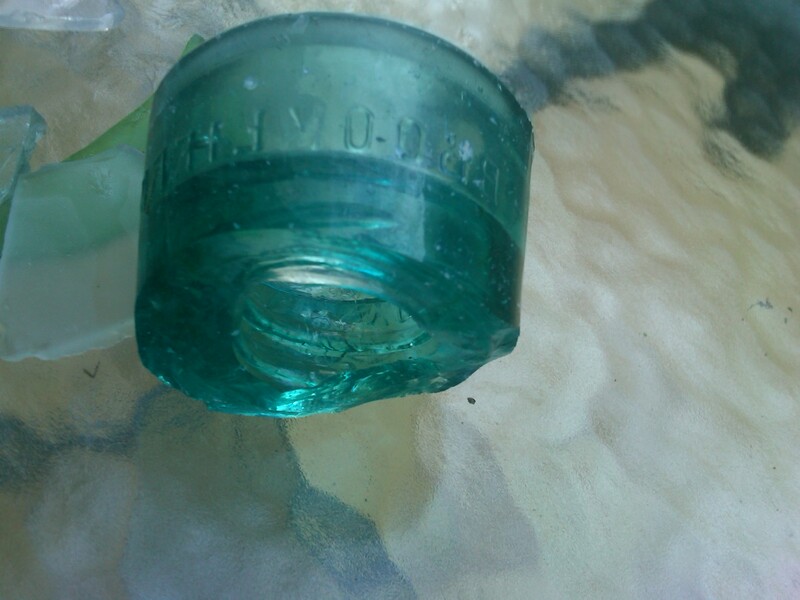 There is some beach glass. In terms of shells we found some intact whelks (knobbed whelks and channeled whelks), but that is probably just because there are so few visitors that come to this beach. Because of the large rocks, the eastern end of the beach is not reachable by all terrain vehicles and you will have to walk! 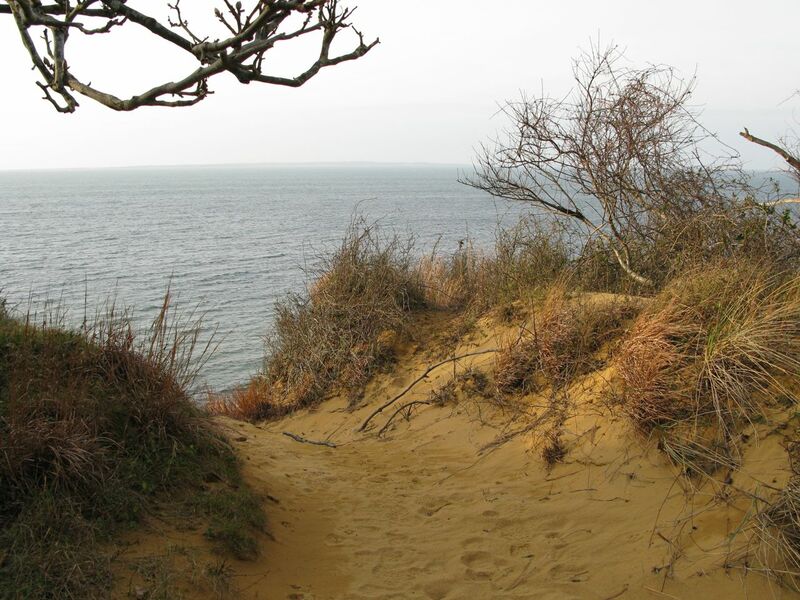 When you reach Rocky Point I highly recommend that you return using the Paumanok path (also called Stephen Talkhouse Path in this section) which winds its way along the ridge of the bluffs with beautiful views of Napeague Bay and Block Island Sound. Note the stunted oak trees on the bluff, that are short and kneaded because of the salty winds. Some of the tree trunks are covered with sand from the dunes and most of the trunk ends up being under ground. On our last visit we saw a red tailed hawk(common in this area). A very informative guide to some of our most secluded bay beaches which takes on even more interest when we see how found materials become the elements of your art. Walked to Goff point and Hicks “Island” yesterday. Great beach glass! Hicks is not an island even at high tide and the 2nd canal (between Goff and Hicks) has not been dredged.